This new premium church theme is a WordPress website design that showcases bold color contrasts, rich textures, and numerous custom graphic elements. Are you tired of seeing church websites that are text-heavy? Are you looking rather to offer a design scheme that offers a friendly, inviting homepage - that links out to your various ministries and resources? 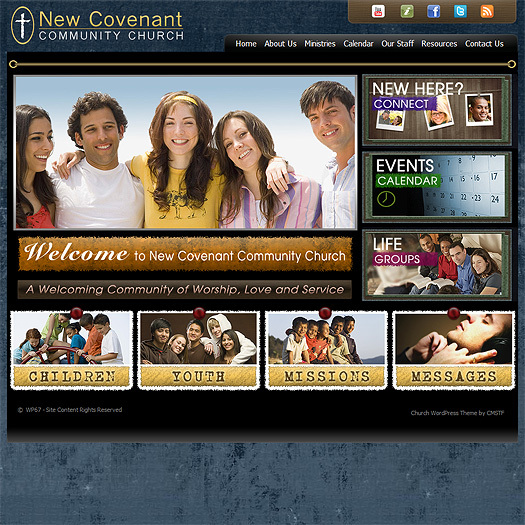 If so, this new premium WordPress church theme is the perfect choice for your congregation. Along with an unforgettable design, this theme features a homepage slideshow, a fully editable, drag-and-drop kind of main menu and three distinct page layouts to choose from.